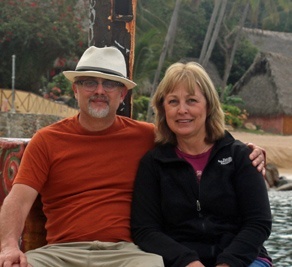 This is a slightly delayed report of our March 2016 trip to Puerto Vallarta. Part 1 was not very exciting, so we didn't put it in the newsletter. You can find it HERE. The most interesting thing from part 1 was our suggestions on how to Rent a Car the cheapest way in Mexico. So this week we are with our daughter and son-in-law and travelling with young people means a very active week. Which is fine with us, we are young at heart. Monday morning found us taking them on Canopy River's "Mountain Expedition" We discovered it a couple of years ago and thought they would enjoy it. Here is a youtube video we made in 2014. So after ziplining over a 400 foot deep gorge, going back over upside down, then rapelling down a small cliff, crossing bouncing / swaying cable bridges, more ziplining, swing on a cable, zipline into a splash landing in the river, tube down some white water and then take a mule back out of the 400 foot deep canyon...... we still made it back to Joe Jack’s Fish Shack in time for their famous 2 for 1 mojitos. Joe Jacks does have good food, but we were in quest of the Red Cabbage restaurant we had heard about from several sources. Oops. Before we could find the restaurant , we got waylaid at Casssandra Shaw's jewelry shop in Old town on Basilio Badillo. At least I escaped with only the usual lightening of the wallet and didn't get talked into one of her "adopt a rescued dog" traps. Again, we set off in search of the Red Cabbage restaurant. Tuesday was a pool day. We met with one of our owners Dennis and Joy Copeland for drinks in the afternoon. This turned out to be our only down day of the week ! We finished up the day with dinner at the Havana moon. We had an unusual experience there …. the food wasn’t very good. That is a not common on the Vidanta Mayan resort. I had rum flambed shrimp, which was pretty good, even though they didn’t flambe it at the table. Son-in-law Brent got a chicken dish which was ok, but the potatoes were powdered mashed potatoes. Although , in fairness, ordering mashed potatoes in Mexico might have been a questionable choice. My wife got banana leaf wrapped fish. No flavor. At all. Rachel got Cuban beef which was very excessively salty and also …. Not good. We have not had a bad meal on the Vidanta resort for a while, so it was a bit of a shock. We had ‘exact’ experience at Havana Moon. The fish was supposed to be wrapped in banana leaf, it wasn’t, and was dry and tasteless. I also had the ‘shrimp au rum” (not the table-flambes) and it was very bland. EVERYWHERE else on property, the food was excellent. Great meeting you and your wife last month Dennis. I should be very clear that this is in Nuevo Vallarta. One reader commented in Spanish on their excellent meal at the Riviera Maya Havana Moon.